Bathroom tiling- all the information you need before getting started. You can take on the job yourself or hire us to take care of it for you. If you have any additional questions don’t hesitate to contact us. This is the first and most basic decision. There are several factors to consider. 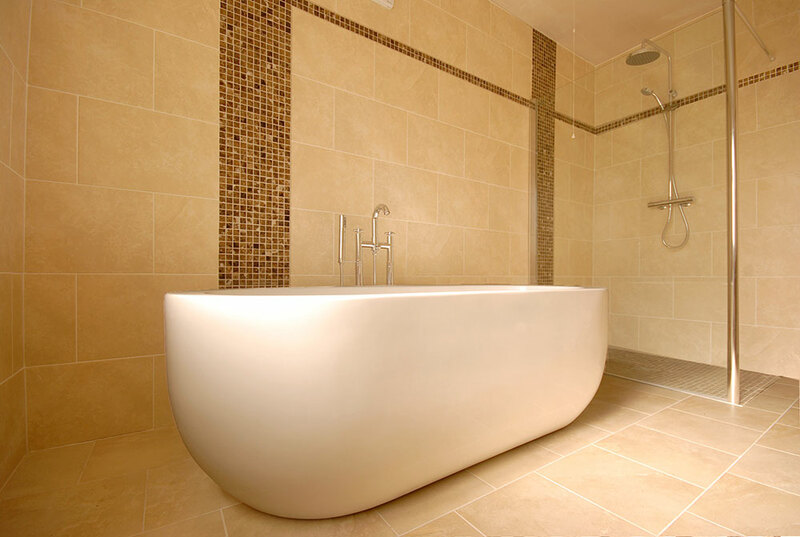 If you have a large bathroom, a free standing bath can be a great feature. Tiling part of the wall behind the bath in a different colour or with mosaic creates a stunning focal point in the room. The traditional layout with a shower bath is great for a mid sized bathroom. By adding a glass bath screen you have the versatility of a shower and bath without needing the extra space for a standalone shower. This layout reduces the amount of wall and floor tiles needed. It is essential to tile the walls around a bath. This prevents water from damaging your walls. This is a priority even if you don’t tile the rest of the walls. The most common bathroom layout today is a bathroom with a 2 walled shower. This makes the most of the available space and can be an open airy option. Glass shower enclosures reduce the impact of the shower in the room. Using a different colour tile or mosaic on the walls inside the shower is an easy way of creating a bathroom feature. 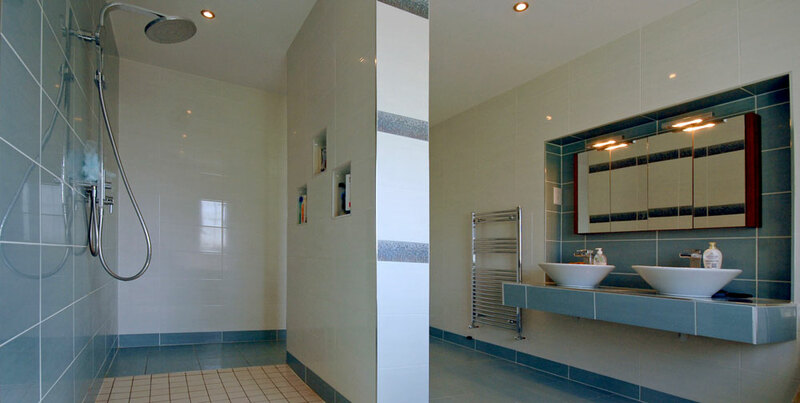 Wet Rooms are the most effective way of using space in a small bathroom. Mosaic tiles or our River Pebble Stone sheets can be used in place of a shower tray. A non-slip tile should be used on the floor. Wet rooms are especially popular as a way to eliminate the risk of trips and falls. HSE grants to retrofit bathrooms for the elderly require a wet room be installed. Marble Tiles are a stunning finish in any bathroom. Unlike other tiles however, most marble requires yearly maintenance. Marble is a porous natural stone and needs to be sealed. The tiles need to be re-sealed at least yearly depending on the amount of traffic. Porcelain tiles are the most durable and hard wearing finish. They are an ideal floor tile that will last a lifetime. It is now almost impossible to see the difference between marble and high end porcelain, once fitted. Porcelain is so hard wearing that it is difficult to drill. This should be kept in mind if you plan on using porcelain tiles on your walls. There is no right or wrong colour or design. Its your bathroom and will last for years. Whats important is that you choose something you like.There are some things worth keeping in mind however. 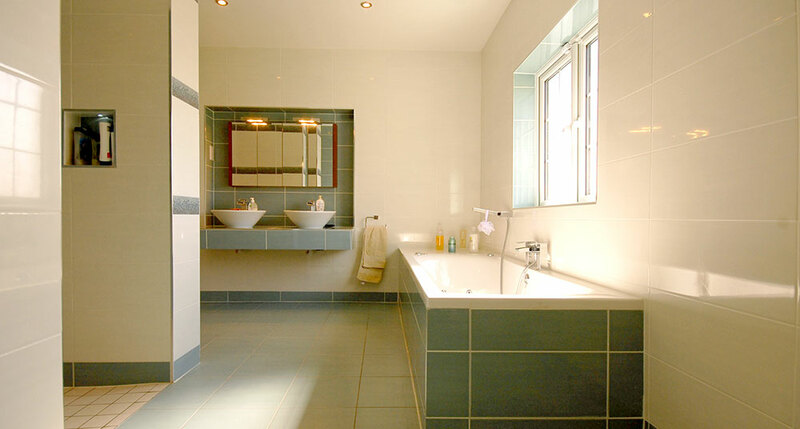 In bathrooms with very little natural light you want to pick tiles that wont make the room seem darker. Light colours, like cream’s and whites, will help to make a room seem brighter. A gloss finished tile can also help to spread the light. Using tiles in a brick effect pattern will need more cuts. This will mean increased tile wastage. 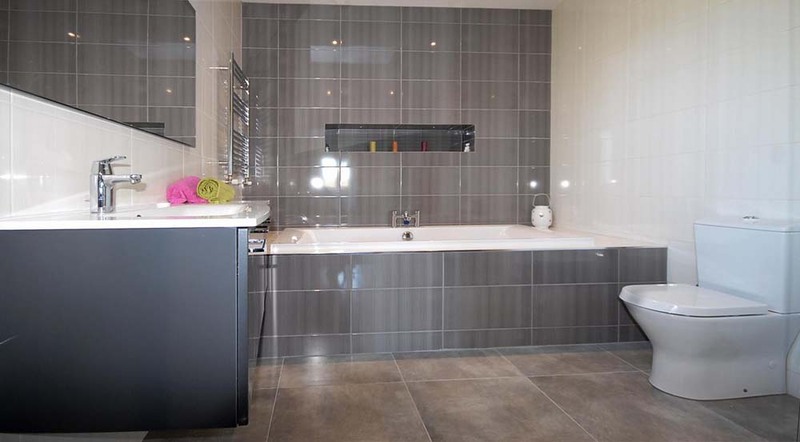 When bathroom tiling, using larger tiles is an easy way to make a room seem bigger. Very large tiles however, will need a near perfect surface to tile on. This can increase the amount of adhesive or levelling compound needed. Most wall tiles are rectangular and layed vertically. A simple way of making a feature behind a sink or shower, is to fit 1 or 2 rows horizontally. Using a different colour tile for this will make it stand out even more. The design options when using borders are nearly endless. There are hundreds of different glass, ceramic or marble borders in a wide range of colours and designs. People regularly use a neutral coloured bathroom tile. Borders are then used to bring colour into the room. One of the most common patterns is running a border half way up the wall. A variation of this is when you run a border one tile down from the ceiling. Another option is to use a border as a frame around a mirror. The same border could be used in a vertical line somewhere else in the room. 2 vertical lines either side of a sink is another common pattern. Insert tiles are also available. These tiles have pictures or patterns on them. They can be scattered around the bathroom or used together as a feature. For detailed info on tiling check out our Wall Tiling and Floor Tilling pages. It goes through everything you need to know before you get a tiler or take on the job yourself. For any other issues or queries about bathroom tiling call into our premises in Mallow, Co. Cork. Our experienced staff will be able to address any issues you have aswell as arrange fitting if needed.